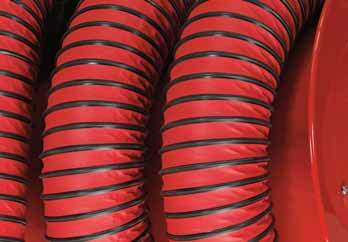 An often forgotten component of fume extraction is the hose of the extraction unit. Fume extraction hoses have many different features each designed for the specific environment and based on what types of air pollutants are being extracted. Acculift will help you pick the right hose for your fume extraction needs and get you the best value/quality ratio in the industry. Temperature ratings below are typical of the type of hose but we will provide you with exact specifications of those ratings based on the hose selected for your business. Here are some of the more common types of hoses and what they are geared towards. Metal Interlocking Hoses: Metal interlocking hoses have a unique floppy-type interlocking construction, allowing the hose to move and bend easily. Some are of stainless steel, while others are constructed of electro-galvanized carbon steel, dependent on your shop’s fume extraction needs. “No Crush” Hoses: The convoluted neoprene design has been specifically formulated to handle temperatures near the 315° Celsius (600° F) maximum range. The hose, which does not contain a wire helix, returns back to its’ original shape if “crushed” by any vehicles or other machinery. Most commonly these hoses are used in vehicle fume extraction such as semi-truck repair shops, bus repair facilities, and tractor repair shops. Standard Duty Hoses: This is the most common hose for vehicle exhaust source capture. The hose easily withstands temperatures at 315° Celsius (600° F) and is ideal for use with hose reels or overhead exhaust systems. The hose has exceeded 160 degrees Celsius (315° F) during certified testing and is rated up to 675° Celsius (1250° F) with intermittent use. Continuous Duty Hoses: These may be used for hose reels, overhead exhaust systems, underground systems, welding, industrial use, light-duty material handling, and more. These types of hoses have been tested, using the bake test, for continuous duty at 175° Celsius (350° F). Furthermore, the hose has been tested, with an air passing standard, for intermittent use up to 290° Celsius (550° F). Welding Fume Extraction Hoses: These flame retardant and vinyl coated hoses come with a polyester embedded steel-wire helix. The helix is permanently bonded for a continuous, uninterrupted inner and outer surface. High Heat Extraction Hoses: These types of hoses come with an outer corrosion resistant mechanical bond helix. A variety of temperature ratings are available, from 148° Celsius up to a maximum of 1098° Celsius (2000° F). The actual hose fabric will vary depending on required temperature rating.